Just came from our almost five-day hospital confinement. And with us is our latest bundle of joy I fondly call SumoSam. He is such a big baby weighing almost nine pounds. His four other brothers all weighed about 6 pounds at birth. It was husband and our Little Man who watched over me and SumoSam. Our set up was kinda difficult as we need to look after two babies at the hospital, but then we were able to manage. Thankfully, there are diners and convenient stores nearby the hospital to supply us with our immediate needs, food included. And I must say I envy husband for having his regular and quick fix of Japanese favorites. Every time he would come back from his quick errand, he shows his brown FamilyMart paper bag full of delicious bites. On our first stay at the hospital, he went for a quick walk and when he returned, he brought “home” some Ebi Tempura. This deep-fried, crispy shrimp dish is my favorite and sadly all I did was watch him eat with much gusto. He mentioned that aside from the very yummy California Maki he had for lunch the following day, FamilyMart also has Tamago Sushi, Futomaki, and Cali Ebi Sushi rolls. These are offered in sets of 4 pieces. He also bought a bowl of Tempura Udon which our Little Man had for lunch. And because I was on my soft diet that day, I was able to take a few sip of Tokyo Ramen. This hearty soup kept me warm and full throughout the day. 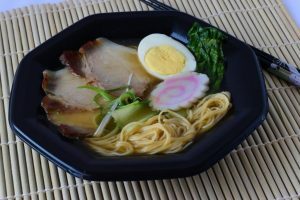 So happy to know that our favorite go-to place for our everyday needs now offers some of our Japanese favorites. Would like to be updated of FamilyMart’s exciting products and awesome deals? Follow their social media channels. Congrats on your new baby! I appreciate Family Mart when we went to Japan because I can buy meals there na walang kahirap-hirap, get and pay lang. It is really hard to buy in the restaurant or fastfood pag may language barrier. Congrats on your new baby! And ang cute ng name ha, Sumosam. It’s one of our favorite Japanese restaurants! Anyway, Hubby loves Family Mart since yun yung malapit sa office nila. For sure, he will be delighted when I tell this good news. He loves tempura! I so understand what it’s like to look after two babies while being on dextrose! I heard about your surgery, I’m glad you’re feeling well enough to blog. Take care of yourself. My kids love family mart. Mukhang masarap nga ang food ano? Pero diko pa natry. Mukhang masarap ang Tempura! That’s a cute nickname, haha. Congrats Berlin! I love Family Mart, and I’m gonna love it even more because I’m always craving for Japanese dishes these days. 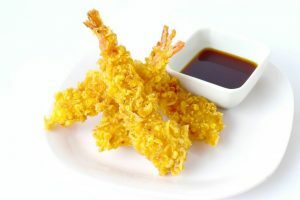 That ebi tempura looks so tempting!